An actress of incredible beauty who has remained in her career as she has always been, absolutely subtle. Never one for garish over the top theatrics or doing anything out of the oridnary to call attention to herself, Kristin Scott Thomas has enjoyed a long and varied career, in romance, in drama, in comedy and she has turned in wonderfully effective work without anywhere near the showiness of many of her peers. She’s the sort of actress one could envision triumping in the golden age of the cinema alongside someone like Garbo, a quie, restrained performer who lets her face do the talking. One of the most incredibly diverse and completely underrated actors of his generation. Jeffrey Wright might just be one of the best actors on the planet right now, and yet for some unknown reason he has never reached the status that he quite deserved. A Tony winning star of the stage, his first major screen turn came when he played the title character in Julian Schnabel’s Basquiat. Though not adverse to appearing in big productions like Casino Royale and the remakes of Shaft and The Manchurian Candidate, his star still refuses to refuse to rise any further. Having said that, whatever may come in the future, his crown jewel may always be the role for which he won his Tony and reprised for HBO to Emmy winning effect, in the powerful, funny and magnetic roles of Belize, Mr. Lies and The Angel of Europe in Tony Kushner’s epic, Angels in America. A name almost synonomous with controversy, Oliver Stone is a Vietnam war veteran and watching the anger and passion that seems to brim over in his movies it is not difficult to comprehend. Never one to shy away from difficult subjects, Stone has delved into troubling aspects and probed the state of the world in Salvador, Platoon and the other two entries in his ‘Vietnam trilogy’, Nixon and perhaps his crowning achievement to date, the monstrously structed and gloriously edited JFK, though many may turn up their noses at the facts on display in the picture, what cannot be denied is Stone’s artistic capabilities in bringing them so fully and powerfully to screen. His World Trade Center movie may have been a great deal tamer than most had anticipated, with the director choosing to tell a heartwarming tale of human survival and the wider effects of the days actions over damning whoever may or may not have been responsible, but with a George W. Bush biopic on the horizon, one can bet that Oliver Stone will soon be ruffling feathers once more. A blackly, creepy, comic look at life in the big city after dark. A haunting yet humorous look at the underbelly of society that will leave the majority of those who view it, appreciating what they have a great deal more. 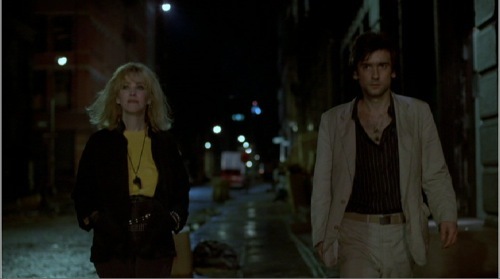 This is not the typical Scorsese picture, only coming his way when financing for his ambitious epic The Last Temptation of Christ fell through, the director comes onto the picture and injects it with his trademark dark, probing look at what can only be described as unordinary human beings. Taking a cast of up and comers and supporting players he crafts marvellously unsettling yet hugely entertaining picture that has more than a little heart to back up its eerie thrills.